Properly understood, the holistic Christian life is the most exciting life in the universe. Yet, outsiders frequently view us as judgmental, narrow-minded, dupes. What’s wrong? We have paid a devastating price for that dichotomy. It is the source of virtually all national cultural controversies and issues plaguing the American family. Most believers don’t understand the first statement, at least not beyond a shallow intellectual assent. Consequently, we present an image that to outsiders ranges from boring to horrifying. Many Jews and Christians have lost their way, because—for most or all of their lifetime—they have been caught in the crossfire between two opposing mutually exclusive worldviews. Of course, the two incompatible worldviews are 1) the Judeo-Christian worldview—God exists and is interested in our personal affairs and 2) the evolution-rooted humanistic world view—God does not exist. In the broadest terms, the Judeo-Christian worldview encourages people to love others before self. The evolution-rooted humanistic worldview proclaims self before others, i.e. “survival of the fittest.” Nevertheless, when viewed holistically, every family and national cultural controversy becomes a no-brainer in favor of the Biblical standard. 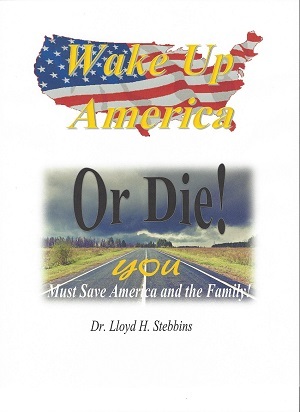 Since Dr. Stebbins’ new book, Wake Up America–or Die! YOU Must Save America and the Family, covers many issues headed, The Undeniable Crisis and The Awesome Remedy, the range of acceptable topics for this blog is equally broad. Let’s have a great discussion. Join the fun! Disagree whenever you like, but be kind and respectful. Lloyd, you went to high school with my wife, formerly Betsy Brown, she led me to your site. You,re on point with your sad view of family and your perspective, this generation desperately needs Jesus Christ, I’ll be interested in your blog and look forward to reading your articles. We’ve been saved and Spirit filled for almost 30 years, have three children, nine grand children,all but one have accepted and walk with The Lord, the youngest one is only three weeks old, I’m wager that Olivia Grace will join early. god bless you as you make a mark. I would recommend that, if you’ve not watched it, to watch Focus on the Family’s “Truth Project” series, it’s outstanding. Glad to hear from you, Bill. Give my best to Betsy. Where do you live? We are in Central Florida, between Orlando and Tampa. I’ll look forward to both of you participating in the discussions on this blog. You can also find me on Facebook and Twitter. Click around the blog site for more information, about me and the upcoming book, “Life, Liberty, and the Pursuit of Happiness: YOU Must Save America and the Family.” Please do me the kindness of providing your views on the blog posts so far. Thank you in advance. time to be happy. I’ve read this put up and if I may I desire to counsel you some fascinating things or suggestions. Thank you. There’s plenty more to come! Lloyd, my wife and I had the honor of meeting with you, and we very much like, as well as appreciate your knowledge and insight as to what is happening around us, and your solutions. Looking forward to reading your book. Your thoughts are always appreciated, Russell.